A friend texted me a thank you the other day for posting this blog (which is several years old by this point) and observed that, if life ever gets too busy to post, I should just repost this one, since it was such a lifesaver and as many people as possible should see it (having been the recipient of this life-changing tip from several readers, I know how grateful I was too). The stomach bug has ravaging the entire East Texas area, and–while my children have emerged largely unscathed (so far) (the twins + Theo are the only ones who’ve had a short-lived bout with it after a stint in the Chick-fil-a play area #ofcourse)–you better believe that my pantry is stocked with both of these items at all times (and that they were a large part of the reason our only stomach bug this season passed so quickly). So! Here you go. A repost of what is currently my most popular blog post according to my analytics page (must not just be East Texas getting hit). About a year and 1/2 ago, Shaun was doing one of his marathon rounds of work trips that seem to come in waves during the spring and then again right around Christmas (when, unfortunately, everyone suddenly gets frantic to spend the rest of their budgets by the year’s end). I had 5 kids, including 20-month-old twins, and I was pregnant with Theo. First trimester pregnant to be exact, so I was feeling suuuuuuper peppy and swell, as you can imagine.As you can also imagine, I was suuuuuuper thrilled when, pretty much the second that Shaun left for his first work trip, we came down with a stomach bug. Yup. Angels were singing and everything. Before 24 hours had passed, every single one of my children was lying on the floor with a bowl by their sides. We couldn’t leave the house due to unpredictable puking patterns (is there any other kind? ), and my feelings of thrilled-ness were just increasing by the moment. (Although, I was oh-so-grateful not to be sick myself). Which is when my kind, wonderful, awesome readers came to my rescue. I posted some sort of pitiful picture of us all, and several fellow mamas told me to get my hot *germ-covered) little hands on some 100% grape juice and a bottle of activated charcoal capsules ASAP. I did a bunch of internet research and discovered that grape juice is, indeed, widely lauded as a preventative for stomach bugs. Something about the particular acid it carries is effective in combating stomach bug bacteria. (AKA the stuff that must, assuredly, coat every surface of the 7th level of Hades). The most important thing to remember, though, is that it’s a preventative measure, not a cure. In other words, once you’re already puking, the only thing grape juice will produce is purple puke. And who needs that? The other little miracle that I mentioned is a bit of a harder sell for kids. Activated charcoal comes in little capsules that can be found at most drugstores (I found mine at Drug Emporium…is that a chain? I don’t know, but it sounds kind of shady, now that I think about it), and it basically works as an absorbent agent to soak up the bad bacteria in your gut. I know that’s a super untechnical description of its properties, but even though I did my due diligence, it’s been a year and 1/2, and I don’t remember all the particulars. I do know that it’s safe, even for small kids, if administered correctly (be sure to do your research on amounts for small children and how often you should take it). And IT WORKS. And! It works once you’re already upchucking too. It helps to lessen the symptoms and shorten the sickness time. And you know what? That time, only Della (our first to fall) got sick. GLORY! 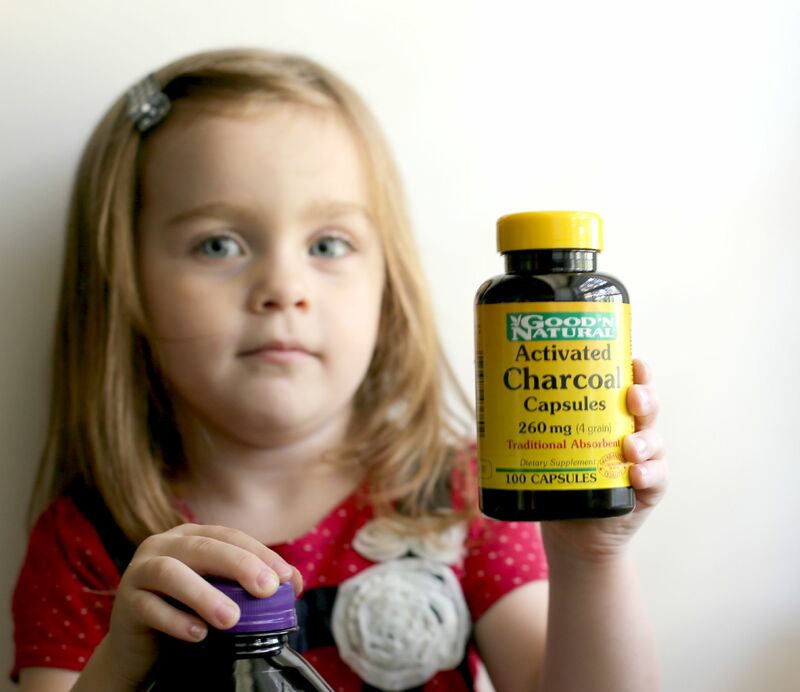 To mix up this lovely, magical concoction, you simply twist the capsules of activated charcoal open, and stir in one full capsule (for older children and adults; I use fractions of capsules for younger). You can do this multiple times a day (up to a point…again…RESEARCH!). It doesn’t have a taste, and the grape juice completely masks the inky black color, but it does have a bit of a gritty texture that you’ll feel on your teeth afterwards, so I suggest downing it as fast as you can go. You can even make it a game with your kids to see who can finish first! And then everybody can snicker at each other’s black mustaches. I’ve used this trick every time we’ve had even a whiff of the stomach crud for the past 18 months (my kids don’t get sick often, but considering our frequent trips to the gym daycare, the sickness does tend to rear its ugly head 2-3 times a year), including this past weekend (you might recall that I mentioned that we stayed home from church due to sickness), and it has made such a difference–so much so that rarely do more than one or two of us get the nastiness and then only for 12 hours or less. So, there you go! One of my BEST Mama Life Hacks for you. I’d happily give credit where it’s due, but honestly, it was multiple mamas who shared this little nugget o’ pure gold, so my heartfelt thanks goes out to all of you. Tell me: did you already know about the grape juice trick? What about activated charcoal? Any “fun” vom stories to tell? We had a nice little incident in Subway when Della hadn’t puked for 48 hours, and I thought we were in the clear that involved an unfortunate amount of puke on the floor right near the drink dispenser + a total lack of readily available wipes on my part (#momfail), and the stingiest stack of napkins ever from the young male Subway employee who had clearly never cleaned up toddler vomit . (Oddly enough, we no longer frequent this Subway). Any great #mamalifehacks to share? Leave them in the comments, or hashtag them on social media, and who knows? I might just feature YOU! (And then, your life would be made. I just know it). I have a 2 year old who is not keeping much water down. I’m concerned. Is it ok for me to give him activated charcoal? Another blog post I read says not to give it to kids under 3 years old. I can only tell you what we have done. I have given it to children younger than 2 years old in very small amounts. Like half a capsule mixed in with at least 4 ounces of juice, at most twice a day. That is not a medical opinion, however. I know this is an old post but do you know much is safe to give a 5 year old and 18 month old per day please? Thank-you! Hey! How many days do you all drink this mixture to avoid the stomach bug from your family?! One time we all got sick at the same time in the middle of the night. Small children attempting to hit their bowls and both parents taking turns throwing up in the bathroom. We were so weak my husband and I crawled on the floor from room to room to take care of the kids. When the peak of the crisis ended I remember laying on the floor around 1am with small children stationed around me, ready to help if they started retching, and croaking to them “Guys, we’re having a Vomit Party! This is our Vomit Party!” I found myself very funny at the time. Is there any reason I can’t use white grape juice? Nervous about the whole purple-puke thing. Their PH balances are different. Purple grape juice is more acidic. So…yes. From what I’ve read. It does matter. Do you have to open the capsule? Can’t you just swallow it intact? This post is actually how I found your blog. I tell everyone about this now. I had the Norovirus and was vomiting for 10 hours straight with diarreah at the same time. I remembered I had activated charcoal. As soon as I took it, I stopped vomiting. My husband got the virus a day later and took the charcoal as soon as he felt sick. ( he should of taken it a lot sooner) He only threw up once, then he took it again, and he never vomitted again or had diarreah. He still had the nasty body aches, nausea, and a fever but it sure beats having stuff coming out of both ends. At least he stayed hydrated and got some rest. I have to try this combo. I have a 1yr old and a 3yr old that are suffering right now with vomiting and diarrhea. I brought them to the doctor really really early this morning like 2:30am-ish and was told that it’s “JUST DIARRHEA”. Wtf?? And don’t worry, their tummy ache is “JUST FROM DIARREAH”. I was praying…praying for god to keep me calm because I wanted to harm the doctor with words that she too might just end up having diarrhea! So I took my little ones home and a friend of mine told me about this charcoal tablet/capsule. I did and after further researching and finding your site, I probably will just give it a try. My babies are my world and it really hurts me to see them suffering. Thanks for this! How long do u keep the kids on the cocktail regimen? Until no one is puking? Or longer to make sure no germs are lingering? We were on our way to church and my daughter said she felt like she had to burp. As we were walking up the steps to church, she said she really felt like she needed to burp. Well, not exactly! She projectile vomited all over the steps. I had eaten after her just a few minutes before as well. Needless to say we immediately left. I had heard of these tricks. I took 2 capsules 3 times a day for a few days and I never got sick. Thanks for this info! Love Drug Emporium. It’s a chain I think. Independently owned and operated. I am glad when I find towns that have them and try to support it. Not shady at all. Thanks for the suggestion. I’d heard of grape juice but not activated charcoal. I’m going to look into it some more and try it! My daughter got sick in my husbands new truck on the way home from church. She had drank Coke and had gotten hot outside playing (it was our homecoming and we ate and the kids played after church. My husband was so proud of his new truck. She started feeling sick on the way home and I had nothing to catch vomit in and there was no where to pull over. I had a blanket and my blan was to let her puke on it and try to catch it all. Here it finally came after much crying and misery from her. I had the blanket ready, and it was projectile vomit. She grabbed the blanket, covering half of her mouth, making what part was uncovered shoot out vomit with greater force all over the back of my husbands head. It went in the speaker holes, in every single brand new shiny, spotless nook and cranny. What did I do? I laughed… It was cry or laugh, and as soon as that first giggle left my mouth and I made eye contact with him, I realized, I should have picked the crying over the laughing. I couldn’t help it, it was horrendous, and I was so shocked, I couldn’t help but to laugh. Now, a year later, we all laugh about it! Ohhhhh my!!! Thank you for sharing this…..that’s a hilarious story!!! Husband came home sick today. Thankfully the kids and I have been out of town until last night, so hopefully we haven’t gotten it. Forgot all about the activate charcoal I bought…until I found this on PInterest. Thank you for the reminder! Went and got 100% grape juice too. You better believe I am drinking up tonight! Crossing my fingers it works for us. Pinned by the way and planning to share. Thanks for the information!!! I have 3 kidos and a husband. Lol the husband being the worst when he gets sick!!! Lol I think I’ll go stock up on these too!! I knew about the grape juice. We “tried it out” this year when my then 5-year old got the stomach bug. I was cleaning up her vomit and thought if I don’t get this because of the grape juice I would be shocked. We had a 2 month old at the time and even though I was nursing I was still very nervous about her getting it. Well, the rest of us (me, hubby, son, second oldest daughter) drank the grape juice and no one else got it. The child that was sick had it for about 3 days…it was that bad! Baby never got it either. I did not know about the charcoal but will be running out to get some so that I have it on hand. Thanks so much for the info! This worked for me. Thanks!!!! last year at our anuual Christmas get together with my dad’s family, apparently a bug was passed around. it was a saturday, and we just got together for the day. there were about 45-50 people there. that evening, the first person got sick. and after that, about 15 other people came down with a horrible flu. i was staying at my cousin’s house, and they only have one bathroom. throughout the whole night there was sooo much puking. in the kitchen sink, in the laundry sink, in buckets, and in the toilet. the next day, sunday, a bunch of us sick cousins just stayed at one house while the parents went to church. it was a grand ole sick party. after the fact, i totaled up the number of pukes and it was *drumroll please* 60 times!!!!!!! out of 16 people that got sick, there were sixty instances of vomit, and not one got on the floor!! it was pretty impressive. 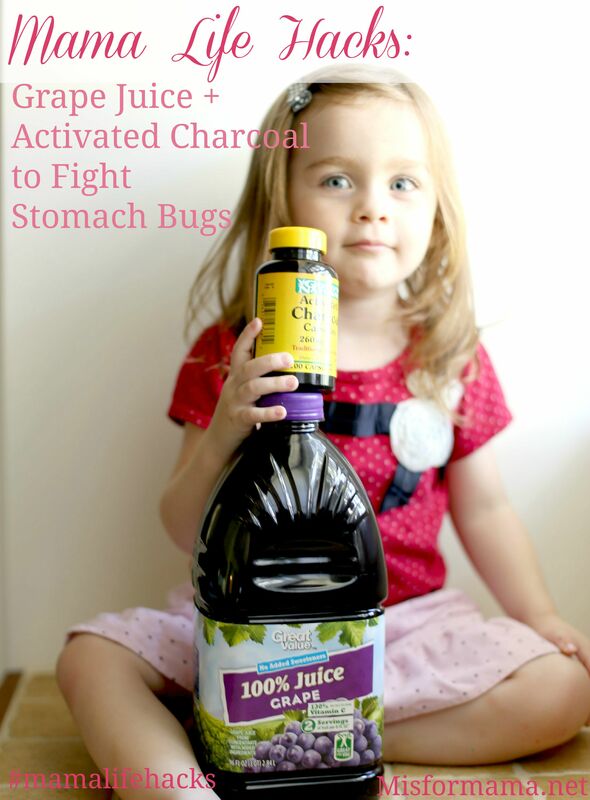 I love activated charcoal for any kind of poison removal! I also occasionally brush my teeth with it. It is awesome at whitening! 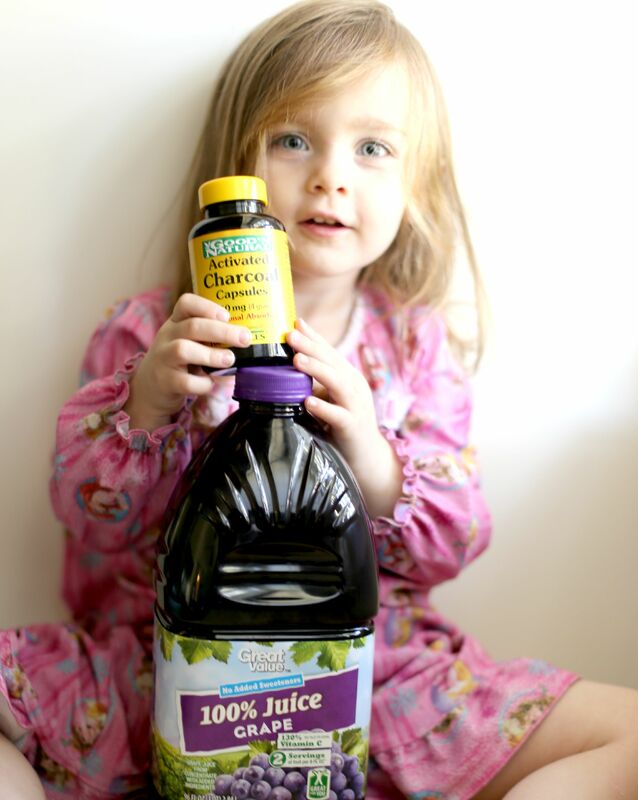 Our family uses all natural remedies and we STAY healthy! I can remember once that I have been puked on (by my 7 year old, last year). A healthy diet, a select few supplements, and powerful home remedies do the trick. Essential oils are my favorite! Is it strange hat I’m excited to try this? No wish for puking, of course! My youngest son gets the sympathy pukes…or the copycat pukes…whatever you want to call it. The second he sees or hears puking, he’s at it! It truly makes for a messy mommy. You know, when you’re cupping your hands under your children so they don’t get it in the carpet? Or am I the only one that does that? Gross! I am gross. I heard about grape juice as a preventative a few years back and now we start buying grape juice pretty much as soon as the weather starts to turn cold. It has been working quite well for us so far. I will definitely be putting activated charcoal on my list for the first aid cabinet! 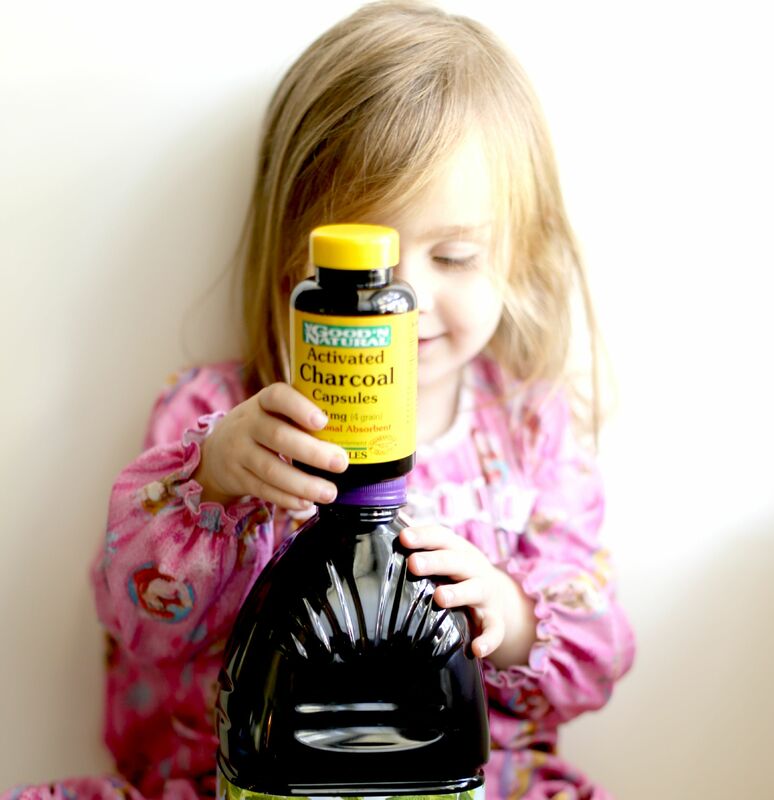 We use activated charcoal on bad bug bites too…mix the powder with a couple drops of water to make a paste. Just make sure you cover it with a bandaid unless you want black stains. Oh my goodness, the stomach bug is the worst. Here is my funny/disgusting stomach bug story! A stomach bug hit us while tent camping with our kiddos. I fed the family homemade chili, because it was a cold night. (I still can’t eat chili three years later.) My husband started feeling weird as we were tucking our kids into their sleeping bags for the night, and in a couple of hours he was running into the woods to get sick! There were two male and two female toilets for the entire campground of fifty lots, so very minimal facilities for us to use. My 5 year old woke up vomiting at one am, and I spent a disgusting hour cleaning up the tent with wet wipes, by the light of my iPhone. She vomited on everything warm she had, bless her. She and hubby went into the car together and turned the heater on- and took turns vomiting out the side of it the rest of the night. My three year old woke up at three am making the familiar gag-splat sound, so had to repeat the process for him and get him tucked into the warm car to wait for the dawn so we could pack up and leave. The night was one of the longest of my life, but it was kind of funny even as it was happening. I mentioned to the lady at the campsite next to us (who gave me a roll of paper towels,some Chlorox wipes, and sympathy) that I didn’t think I could bear to open the bags of laundry when I got home, and she suggested that I drop the wash off at a commercial laundry and have them do it. Best advice ever. I dropped the worst bags off with a blush and a “So sorry,” and picked up sparkling clean things the next day. The bug made its rounds through the rest of the family a week later, when we had indoor plumbing! I called the state park to let them know not to rent our ground until they had a good solid rain. The whole lot was splattered. What is your recipe for the cider/grape juice cocktail? Right now the stomach bug is traveling from one to another in my house! Good to know! I have a similar hack for illnesses with fever-elderberry syrup! If someone succumbs, I give them a teaspoon multiple times a day-helps lessen the illness time. I also immediately start giving teaspoons to the rest of us as a preventative. It definitely helps. Isn’t that always the case? As soon as one parent leaves all h-e-hockey-sticks breaks loose! Essential oils work wonders always and my favorite part is they are natural and safe for young’uns. I’d love to give you some to try!